Jonathan Cahn, who caused a national and international stir with the New York Times best-seller The Harbinger and then The Mystery of the Shemitah, now brings us a treasure chest inside of which are contained some of the greatest mysteries of all time. The reader will discover life-transforming secrets, mindblowing realities, and heart-changing revelations in such mysteries as the Face in the Waters, the Leper King, the Land of Gezarah, the Secret of the Third Prince, the House of Spirits, the Mystery of the Rains, How to Alter Your Past, the Second Scroll, the Similitude, the Mystery of the Eighth Day, and much more. 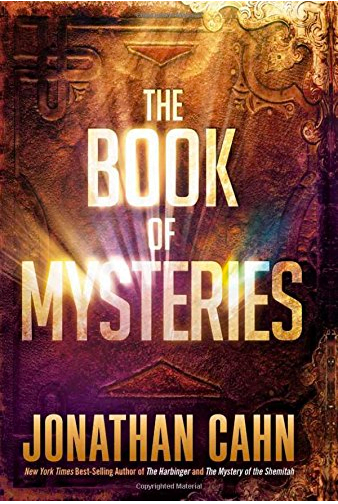 The Book of Mysteries takes the readers on a journey of divine revelation through ancient Scriptures, the laws of Creation, the deep of God’s Word, the hidden streams of history, the most important keys of spiritual truth, end-time mysteries, and the secrets of life.